The indexes are a little clunky, but useable. I just found out about this in the National map corps Forum. I got 2 KML files for Google Earth overlay and they look awesome. I just started using it and it works great so far. But have only just started but looking good so far. I need to learn how to calibrate the coordinates for the different sizes. Nope - didn't work here - though I can't see geocaches on google earth either. I'd like to use it to see both (not at the same time). It sais incorrect parameter - anyone have any ideas? I bet this overlay will be neat once its working for me. BDT: I will pass your ? 's along. 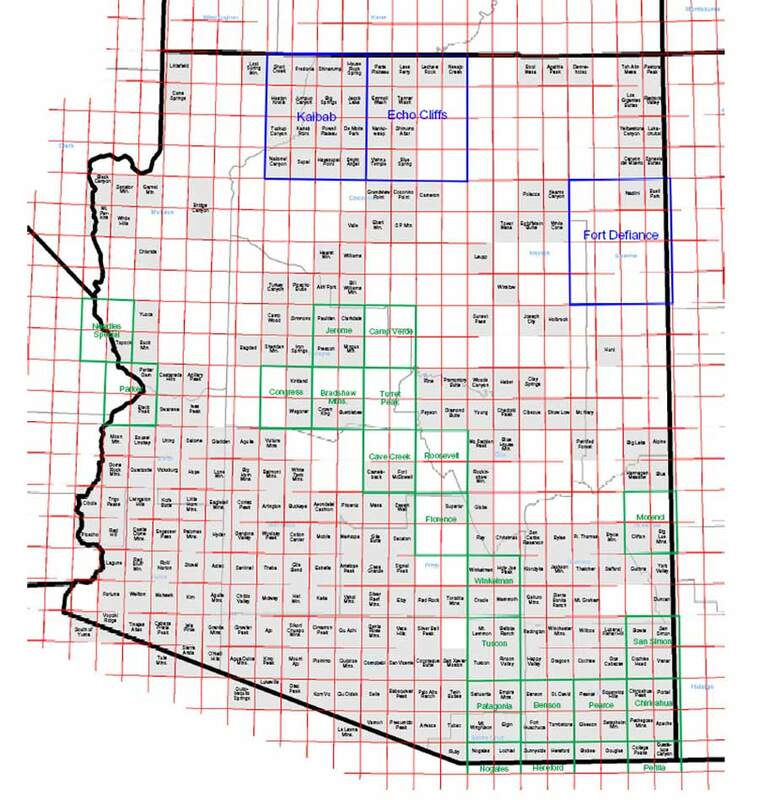 "HERE is a list of "Historical Quadrangles of Arizona. It gives the map name and date for the map. A viewer is available for downloading free. And with GPSTrackmaker you can see your coordinates of anything in Google Earth it has a built in program for it and TOPO as wll as all the free mapping functions. You just have to set it to which ever you prefer. Maybe this will help with the above as far as making shape files. It only works with Garmin's. I have not tried this one yet I just learned of it. The others if you need help let me know. Here's a copy of the base map for the above list. The full sized version is available at the above link. A couple of weeks ago I contacted USGS and asked if they had an electronic index (shapefile, etc) of the old discontinued 15 minute (1:62,500) map series for the U.S. They responded that they do not. I am working on a way to develop such an index and hope to be able to make it available in the next couple of weeks. It would show the 15 minute series geographic extents and names along with the current 7.5 minute quads covering the same area. If you can do this for the entire U.S., it would be extremely helpful (and I will be eternally grateful)! I've got JPEGs that show the 15' quads for Northern California and Southern California. They're a little hard to read, but at least they're something. They're about 1.5MB each. Here is the Arkansas pdf. This is the State for the Initial Point of the %th Principal Meridian. I couldn't get the viewer plug-in to install. Must I resort to Internet Exploder? We found that it was necessary to "unzip" the install 'icon'. Once we did that it started the regular 'Install wizard'. We installed it to C:\program files\lizard tech. It is a bit outdated is the user interface, but it is easy to get used to it. For best resolution, right-click on the small map and select full screen. Hey guys - below please find some answers to questions Black Dog Tracker had. Maybe y'all shared in the curiosity and this will help. There are 2 people I have as resources now. Keith - from the Rollo office, and a fellow named George, who Keith put me in touch with. George set over 1500 marks over his career with the USGS. He worked in the "mid-continent" states (maybe some of you have found the ones he did?!) If you want to contact them directly - please let me know and i'll hook you up with their info. 1. If we ask for a name of a 7.5 minute quad, could the USGS translate that name into the parent 15-minute quad name and then give the index, drawing, and mark location information for it. The reason I ask is that it's easy for us to refer to names of 7.5 minute quads, but we have no index of 15-minute quads, their names, or their locations. Keith's answer: We have books that translate that already. If we get a name for a 7.5' map, it is cross referenced with the number of the 15'. 2. Is there any way to divide up the index and pages into 7.5 minute quads, or should we just go ahead and expect to be getting information by 15-minute quad only? 3. What do the numbers on the drawn map mean and how can we use them to help us find the USGS marks? George's answer: If your reference is to the numbers on the 15' control lists (drawn map) these are merely reference to the lines in the lists - shown roughly for reference only. On the lists that I have locally for vertical control the numbers are for USGS 3rd order lines and the letters are for NGS 1st or 2nd order control. 4. 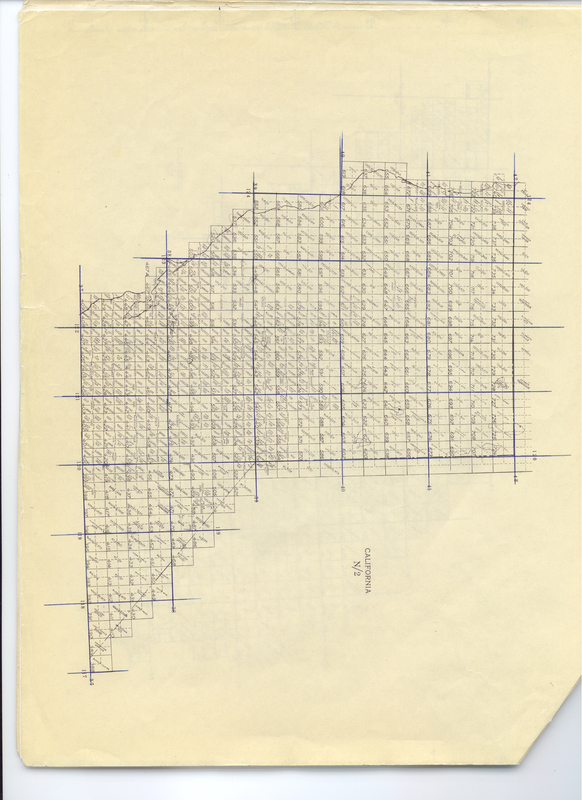 When we call or write for the pages, drawing, and index for both horizontal control marks and vertical control marks for a particular topo map, what is the standard wording we should use in such a request? Keith's answer: I think just request both files out of the folder, horizontal & vertical. We are short on staff here, but we should be able to photocopy one folder and mail it out in a timely fashion. Maybe on day we'll have the resources to put the notes out on the internet. that would be great. George's answer: The only thing that I could add to this is: remember that there are two kinds of control: (A) vertical (shown with a X and vertical letters and numbers . . BM 1272 [versus slant lettering for elevations that are merely "spot elevations" on map identifiable features . . by a X-roads for instance could be 1272 meaning that is an elevation within map accuracy standards but is not control). It is also worthy of mention here that if one is geo-cache-ing for vertical marks with a GPS hand held unit that there are no horizontal values for it - the only way that these could be recovered is from eye-balling from a map or with descriptions from a control list. 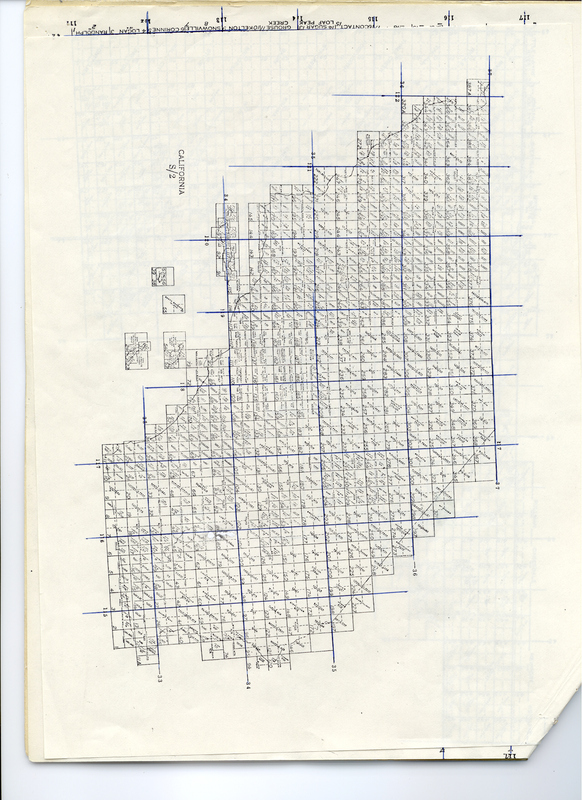 and ( horizontal (shown with triangles - sometimes there are vertical numbers which would indicate that a vertical elevation has also been established on the mark but often these are only horizontal control) - and often the name is shown if it is a NGS triangulation station (i.e. Jones). 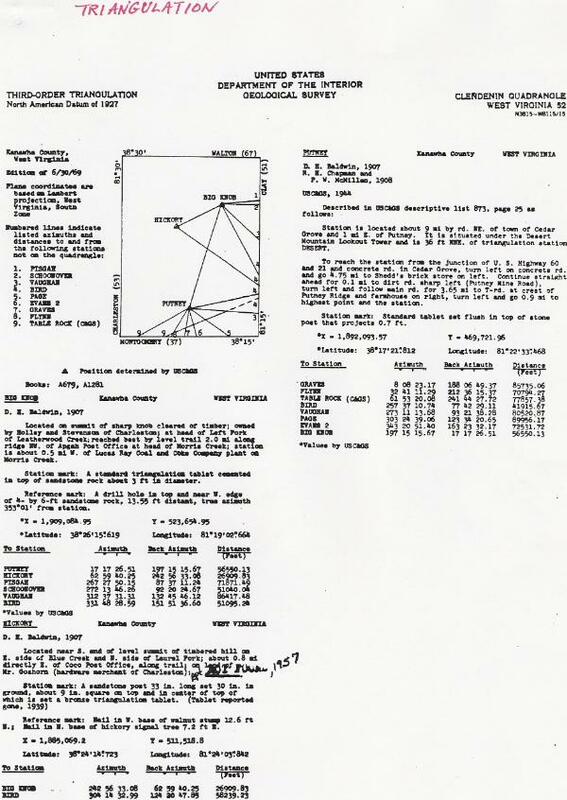 Note: triangulations stations are usually are on high prominent hills - the surveys were, indeed, done with a theodolite turning angles only (no distances were measured) and thus the term triangulation. And, of course, these could be found with a GPS unit. In a recent experience with a friend's unit (I do not own a GPS) we discovered just how terribly accurate this equipment is. A mark is set near Wausau, Wisconsin (our home here) where the 45th Parallel (N) crosses the 90th Meridian (W) (only happens in four places in the world). Well, we discovered with his little hand held unit that the mark has been set about 1,100 feet out of position - think they did that for convenience only so that it can be accessed from a road (sort of the equivalent of "Drive Through Geo-cache-ing" I guess. McDonald's - eat your heart out. 5. Does the USGS want reports from us on any mark, including the nails and spikes, or just the "permanent marks"? Keith's answer: I think they would take anything they could get! George's answer: As far as I know, only the permanent marks are of interest as far as current condition - however, if it is a substantial temporary mark (chiseled square on a concrete abutment or something of that nature) then there would still be an interest. Though, often these are hard to find. And, in the case of NGS 'temporary' marks a monel metal rivet was set in concrete structures - these are about as permanent as a standard tablet. The rivets are shiny like brushed aluminum and usually stand out pretty good (and would be shown only with the vertical numbers on USGS maps and no BM . . i.e. 1272. That's true for Hatley...I see it there. Also on the Ringle, Wisconsin 7.5 minute quad. But, although I haven't done an exhaustive search, the associated 15 minute map is not indicated on the 7.5 minute maps I looked at in Arkansas and New Mexico. I wonder why the difference? Maybe it's just a Wisconsin thing? Thank you, Keith and George, for helping us understand more about the process of finding and reporting USGS marks! Well I got the packet Keith sent me of the whole "Clendenin" quad. Its 54 pages of reference marks (I feel like I will find very few of) and benchmarks (which is like 50/50 to me as far as finding em'). How do I look for such a mark - I must admit to being confused with the differences between NGS and USC&GS. I get that USGS was a different Dept. altogether. As an aside - I also received 2 other documents. One that has hand written notes all over it, called a "Transit Traverse" and another which was a 3rd Order Triangulation sheet. Still trying to make heads or tails of it all. If it were me searching there, I must admit that I'd search for only those "permanent" marks listed in the Clendenin quad's index sheet and ignore all the reference marks. "Z 7 1933" (USC&GS) is possibly this mark. If it's that one, the first Clendenin mark would be a fair ways away from that Z 7. The National Geodetic Survey (NGS) is part of National Oceanic and Atmospheric Administration (NOAA), which is part of the Department of Commerce. The predecessor of the NGS is the U.S. Coast and Geodetic Survey, variously abbreviated as USC&GS, USCGS, and CGS. The predecessor of the U.S. Coast and Geodetic Survey is the Coast Survey. The United States Geological Survey (USGS) is part of the U.S. Department of the Interior, a totally different agency. Did either of those other sheets have the horizontal control (triangulation stations) data on them, like the coordinates, station names, and instructions for finding them? BDT - sent you some photos of the sheets to post. I think you found the right mark - but............... its on the OPPOSITE side of the river from the next listing on the page - a ref. mark .24 miles way - weird! Also, trying to use topozone at the moment to find some of the marks on the new sheets I received - but I can't get the coor. in the ones I use in my GPS - HELP. Here are the 4 sheets that frex3wv sent me. 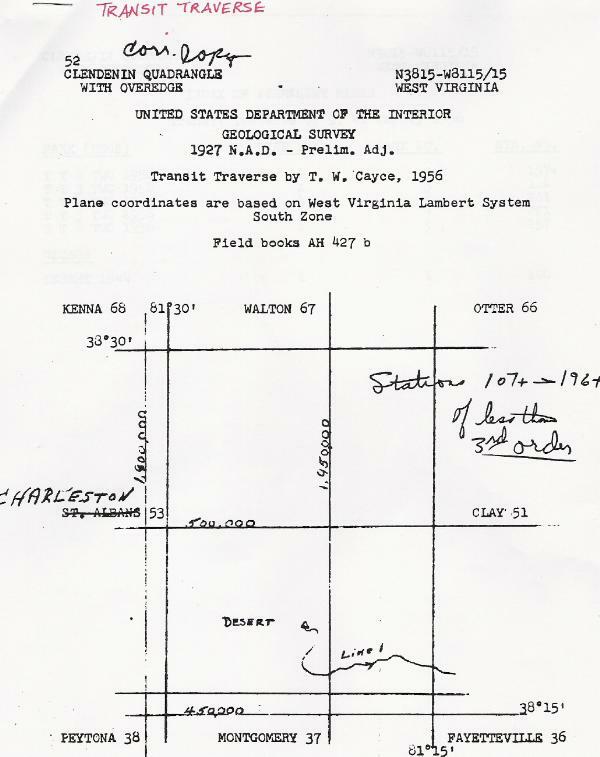 This first one includes the descriptions of the 3 USGS marks that Holtie22 said should be requested in an investigation of Clendenin quad marks. This one is an index of the permanent marks in a "traverse 1" that is on the Clendenin quad. This one shows the location and diagram of "traverse 1". 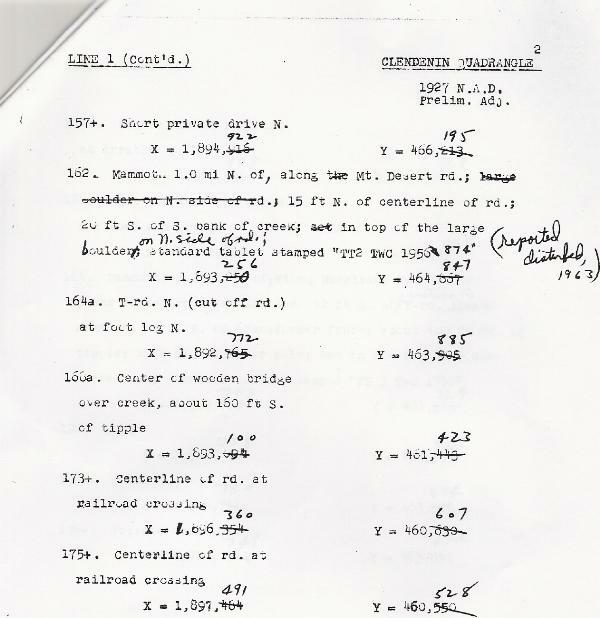 This one is page 2 of descriptions for "traverse 1". 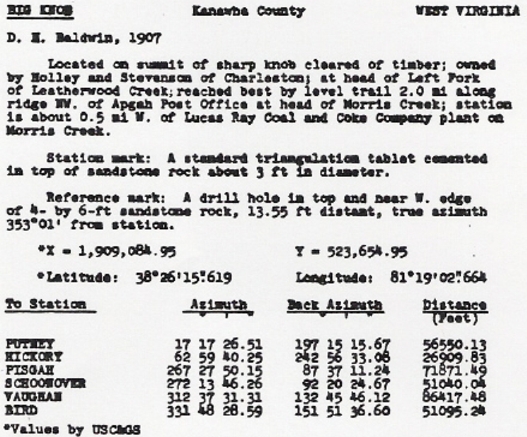 It includes location information for one permanent station, "TT2 TWC 1956". Edit: Here is an attempt to magnify the Big Knob description from the first picture above. As Holtie22 was saying previously, old coordinates like these will need to be converted to NAD83. Thanks for posting them BDT. Tons of questions arise - but will ask this one for now - say i was going after the one on the edit above - how do you do the translation - which numbers on the sheet are used eyc etc. 2) Is there any particular reason to find this mark (besides the obvious - to see if its there and useabale etc).? CORPSCON from the US Army Corps of Engineers will convert state plane coordinates, which are the X and Y numbers on your sheets to lat-lon for use in your handheld GPS. I took the lat-lon from the last page posted above for Big Knob and ran the conversion in CORPSCON, using NAD27 lat-lon input and West Virginia South NAD27 state plane coordinates, and got precise agreement with the X (easting) and Y (northing) given there. That means you can use this tool in the reverse direction to turn all of those X and Y values into lat-lon that will work in your handheld GPS. Your choice whether to set the GPS to NAD27 or convert everything to NAD83. Hey all - well a few days ago I decided to look for some marks on a line very close to home and here are some conclusions (though I know they are not hard and fast - but nonetheless my experience to date). There are tons of reference marks - and here is what I am finding as I drive the line: 1) box culverts gone 2) trees possibly gone due to road widening 3) Power polls replaced since the reports were done 4) bridges long since replaced 5) chisled squares in "sandstone" ledges - VERY hard to find due to erosion of hillsides etc etc 6) New description found "copper nail and washer IN ROAD" (caps added by me for emphasis) - are they kidding???? I did find a benchmark disk - so that was nice! Will post it on Waymarking soon and put a link to it - but pretty standard stuff. I thought of an analogy too: USGS hunting is to NGS hunting as letterboxing is to geocaching. Also - if anyone has any thoughts on my posts from 9/29 (7:41pm and 9:07 pm) I would greatly appreciate them. Why use the X and Y numbers when the Latitude and Longitude (in NAD27) are already given? Ah, I see. I was only looking at the Big Knob mark, which has both X and Y, and Lat and Lon..
Hmm, now that I look at those texts, I would think that the traverse stations are not really marked with anything beyond the most temporary kind of marking. I would tend to doubt that the USGS has any interest in their being recovered. The traverse points that Black Dog noted are very special. They called photo identifiable or picture points. These are points that are very distinct (e.g. centerline of a road at a RR crossing) that can be easily identified on aerial photographs and are used to rectify the photos into a mosaic from which the topo maps were ultimately made. Since the primary objective of USGS was to make the topo maps these points were actually more important to them than the monumented points were. Once these points were positioned, as long as the features weren't moved or otherwise changed, they could be used multiple times as maps were revised without having to go back to the field to rerun the survey. Maybe I'm missing something, but aren't those Big Knob coordinates from 1907? What datum would that be? Using those as inputs into CORPSCON as NAD27 datum coordinates doesn't seem right to me. Maybe the error is not significant for our purposes? The State Plane Coordinate system did not come into being until the 1930's according to what I've read. So most (all?) documents quoting SPC values should be late enough to have NAD27. The station set in 1907 must have had its values converted or else remeasured in NAD27. I finally found a USGS reference mark! It was on the corner of a step of a house (I got permission). It is so worn away that I may even be seeing something that doesn't exist. Too bad the original mark was either gone or buried by fill dumped there when the nearby road was raised a few years back. The witness sign is still on a nearby power pole too. That was the middle of my day of looking for about 10 marks and finding 2. And I was only searching for DISKS! I am still not sure if it is that the descriptions are so bad that I am looking in the wrong spot, or if the marks were set in poor places and have been destroyed. I suppose it might be a bit of both. The one thing that has been consistent in my hunt for about 50 USGS marks so far--if I don't SEE it without disturbing any soil, my chances of finding it are zero. Not "low". ZERO! I have yet to find a mark by metal detecting or probing. In my experience they are either "there" and obviously so, or gone. Your mileage may vary. Zhanna said she had BETTER luck with USGS marks than NGS ones. My success rate has been so dismal I am about to give up and go back to NGS marks, despite the 40+ minute drive it takes me to get to the nearest one. AS promised - here is the link to my most recent USGS find. Forgot to mention on log that my Mag. 600 gps showed an elevation of 692. USGS measurememnt - 687. Sorry you are so frustrated looking for the NSGS marks - but I know what you mean! As for your comments on descriptions - I have found that the mileage data is spot on (as best as I can tell driving it). Also, it does seem pretty clear that that around here anyway - the disks are placed in concrete which is the typical 18 (or so) inches above the ground. Therefore, I am inclined to agree with you about the chance of finding them with a metal detector. Don't give up just yet though my fellow benchmark hunter - these finds - since so difficult - may be that much more rewarding - and if you find one of the reference marks I am still convinced were never meant to be permanant - then that will be a big time find each and every time. Yes they are a little more difficult to locate. And as you say much more rewarding. I have found several hundred of the several kinds. I wanted to also say I always use the TWP., SECT. and RNG. on the descriptions then refer to the Topo map. If I am not mistaken these are the one's also listed on the Topo's. At least all of them I found were. I also have learned to use the rounded up Elevations. It might be a 807.56' on the page but the Topo will read 808'. I have found that most of mine are marked on the topos, as GeoTrailblazer mentioned. After all, these marks were set primarily to CREATE the topo maps. The elevation is always rounded. For some reason, about 10 percent are not on the map and of those I have been able to pinpoint most. To date I haven't taken the extra time to make the USGS marks waypoints on my GPSr, so I use the map to get to each location. This serves mostly to remind me that I still know how to use a map, but isn't the safest thing to do when driving back roads. Geo, actually they are EASY to locate! Except for the fact that I often start looking in the wrong place because the description is vague, every single one I have found has been exposed and very easy to find. The ones that aren't EASY are IMPOSSIBLE, and I don't find them. I have looked for a few UE marks (and even found one that was a chiseled square) but haven't bothered looking for what Dave called Picture Points, since I wouldn't really know what to report. I suspect those are non-permanent marks as most of them would be easy to change, for instance, repaving a street might change an elevation by 2 to 4 inches. My biggest challenges are the ones that are not along a line. One of my quads has a list of marks that were not part of a traverse or line and they are just listed in the beginning. Some of them reference towns that I can't even locate any more, or say such things as "At Conewago Station, across from the station, in a rock". First off, does Conewego Station mean the station at Conewego (which is a tiny town that DOES exist), or does it mean the (even smaller and now nonexistent) town of Conewego Station? Another is three miles west of Bachmanville. Bachmanville still exists, but there are no roads that go "west", as least not directly or without a bunch of Ys and crossroads to confuse the issue. These are the ones that I think will be fun challenges--doing the research to find out exactly what they mean, and hopefully locating them. They seem to be the older marks too, probably used in previous map releases. I'm not giving up. But I might take a break for a while if I get too frustrated! I use to love it when Placenames were there on the list. I have found that Most of those RR stations are now gone. That is where the history lessons and searches come in. I have found many from the Placenames list,it did or does give directions to Historical points and their resppective distances. I just looked again and can't find Placenames anymore...................darn!! Maybe it went to this. Has anyone else tried for these marks recently? No you guy's keep me so busy doing the maps. Yes seriously I just got through with a 911 GIS project and used some of the USGS chisled squares for some of the control. More play than anything real serious though. I have been working on another one being discussed and have not posted my finds I need to go check out soon as weather gets right. Great find by the way. I recently decided to simply drive and try to establish some of the "lines" starting and ending points on my sheets and am abit baffled by the following entries. Ok - so here is what confuses me. The first mark at 0.00 is across a river from the actual mark as listed after 0.24. Is there a chance this measurement was "as the crow flies" ? Did they do things like that? From what I can figure - all the distances on these sheets are as you drive and are pretty pin-point on. Secondly - I am still not sure what they mean by a painted bolt with the elevation on it. How can that be? First I would do both. I would tie to point 0.00(coordinates you got) and tie to a point 0.24 mi. (I would use my trackmaker and come up with a long and latt near center of bridge) to fit the description. Then from 0.00 I would reset my odometer or pedometer to 0.00 and head that direction to your predetermined location. I think they are really to drive to distances. Turn your track on at 0 point and see the length of the track. Not hard to stamp 4 numbers on a 2" or 3" bolt head. And the bolt is near the center of the railroad crossing. I have seen marks that were just a round-headed carriage bolt embedded in concrete with no stamping. If you are looking for a mark on that abutment or foundation, it will be obvious as the only one of its type and not holding anything down. They could have set a similar one in a street. When they used it, they probably painted the identification and elevation on the surrounding material and the marking will be long gone. Secondly - I am still not sure what they mean by a painted bolt with the elevation on it. How can that be? ..
Is there no bridge across the river close enough now? Was there back then? Is that line 12 on the same map we saw months ago? I recall the roads on the online 15-minute topo map were not all on the same route as on the 7.5-minute map. Some of the old route was still there, but not all, and the crossing point may have been different, I don't recall. 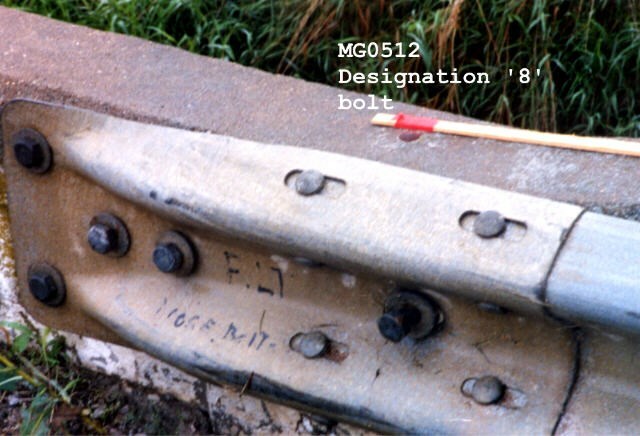 The painted label may have been on the ground (or what's on the ground) next to the bolt, not actually on the bolt, with the bolt just painted to match the color of the labeling on the ground. It would have to be Really good paint to last from 1933 (or earlier) to now. The railroads have been abandoned. The Baltimore and Ohio (SE side of Elk River) is over grown, but the tracks are still intact. Finding Z 7 might be your best bet - don't rely on the coordinates, though - they are scaled! On the other side of the River, the New York Central RR is long gone, and an Interstate highway has been constructed. It may still be possible to locate the vicinity of the UE 612.1 mark, however, by comparing the current Google Maps satellite image with an historic USGS map that depicts the old RR crossing. Don't expect to find the bolt with everything that has transpired, but you might be able to calculate distances from this spot. As far as the 0.24 distance is concerned, since there doesn't seem to have been a bridge nearby, this is probably the distance along the route of the survey traverse, which most likely would have crossed the river at a right angle, then headed down along it. Seems to fit pretty well with the bend in Conner Drive. So where does line 12 go from here? NW? BDT: Yes - this is the same line 12 on the "map" that you posted for all see awhile back. Believe me when i tell you - I am no where close to finishing up this quad I am on (with its 54 pages) - though I am sure y'all probably would have been. Benchmark stuff is all so new to me - its all I can do to understand you guys, but I am trying - and AM proud of the few recoveries I have made and figured out. Best as I can tell - there was no bridge in that area - so the .24 I suspect holtlie has figured out. Holtie - I wish I could tell you which direction the line goes in - it heads north than turns. And therein is some of the difficulty guys - sometimes the "line" obviously starts on the last written description and goes the opposite way. Great huh?! Than the next line is in order from top to bottom of page. Part of my weakness is my inability to really interpret the maps you guys find and use. Wish you guys lived nearbye - I would pay to take a class from you on all this stuff. And just for fun - look at a description I found on another line: "Turner; in front of station; top of rail"
I have no clue..... do you? Ok, all this talk about BDT's map posting has me confused, because Line 12 is at the left edge of the map, and I am almost positive it shows the intersection of Rt 43 and Creek Rd. I think the map to the left is the Charleston quad and Line 12 is mostly on that quad. Frex3vw, I think the key to finding this mark is to find out where the old pump station was and find the road to it. Then hopefully you can find the intersection to that road and the location of the railroad crossing, whether it exists or not. Below is the topo map of the area around Z 9 with some marks to indicate a bit of guesswork on my part. At the bottom left is a purple circle, which is the intersection of Connor Drive and another road (in fact, it is the only intersection on Connor Drive). The NYC crossed this road just below the circle. This is well over half a mile from Z 9 though. With so few options regarding Conner Drive, I branched out, thinking there may have been an error in data entry. Across the creek is a green circle at the crossing of a road and railroad. If memory serves me right it is about .3 miles from Z 9, so it is not a likely candidate. To the north is a red circle and is my best bet for the bolt. I don't have a lot to back this up, except that it measures to about .25 mile from Z 9. It has a railroad crossing and a road leading to the northeast. And that road leads to a circle on the top of a hill with two dashed lines leading to it from the river. Could it have been a pumping station, maybe with a water tower at one time? 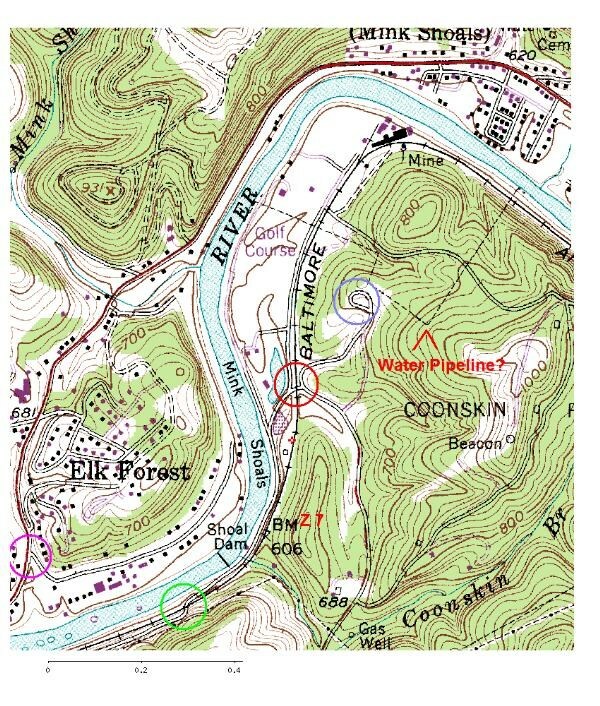 I know I am stretching on this one, but the evidence that I can dig up doesn't match the distances--I don't think there is a place along Conner Drive across the river that the mark could have been. Conner Drive shows up on both the new and old topos and was always a short road that had only one intersection. I also agree with your earlier post that distances are measured by travel, and not traverse. There would be no reason to continue a line across a river. They simply would have started another line. I am pretty sure that the majority of Line 12 is on the Charleston quad. Follow the arrows on the line and see which direction they head from Z 7. That should help decide if you should head north or west from Z 7. I guess the bad news in all of this is that there is a near zero chance of finding the bolt. By the description it was in the middle of the road and unless there has been no activity in that area for decades, it will have been removed or paved over. Thanks guys for the responses - The weather has turned wintery here - so I will contemplate my next move on dealing with this line. May have to try and attack it from the other direction. "Turner; in front of station; top of rail"
Also - I read (and than googled) a new term to me - "lampblack" factory. Pretty interesting. How cool would it be to find THAT factory - or the remnants - all these years later. Top of rail means just that--the elevation of the top of the railroad rail at the Turner railroad station. Like most of these UEs it is subject to change since the railroad may have done work on the track at that location (just cleaning ballast might result in a slight elevation change, as would replacing ties or rails). That is why I don't bother looking for the UE marks. Too bad that winter has arrived. We got a bit of snow up here in PA but it isn't enough to keep me home this weekend. It just makes the search a bit harder. I'm just wondering how many of you have undertaken this USGS mark recovery task. I requested & received datasheets for an area around home and an area that I somewhat frequent to the SW. In general, 99% of the marks in the home area have notes such as "reported destroyed, 1953" or "reported disturbed". I've sought 3 marks in the home area thus far and only found one; it is along what was once a road but now is "Old Country Lane", a multi-use trail. 2: submitting coord data in NAD27, NAD 83, WGS84? 3: submitting in MS Word or Excel? I'd just like to get some ideas; right now my recovery write-ups are pretty much coords (WGS84). I haven't submitted anything yet to the USGS. I haven't yet, but am looking forward to responses. I am looking at several quads to request the information on, and need to go back and look over this thread again. I've recovered some--either ones in the NGS database or those shown on USGS maps--but have not submitted recoveries yet on any to the USGS. yes, I read the whole thread and have scanned thru it many times seeking answers to the questions I posed. I understand what the USGS requires for reporting, but wasn't sure if people are providing any types of updates or 'descriptive enhancements' to their reports.